What's the big deal about Proportional Representation? Everyone should have an equal voice in government. If that voice is not one's own, it should be a voice for which one has expressed strong support, chosen from a list of many diverse alternatives. Major decisions in government should have a mandate from a majority of the people. No voting procedure in use in the world today can completely fulfill these goals. The voting procedures used in nearly all elections in the United States come nowhere close. To demonstrate this, we can look one of the exceptions in the United States: elections of the city council in Cambridge, Massachusetts. Cambridge uses a voting method where voters rank the candidates they support in order of preference. By collecting this information, Cambridge at least has a chance to satisfy the second principle listed above. In the 1999 election, approximately 19,000 votes were cast for 24 candidates to fill the 9-seat council. By counting these votes in different ways, we can see how well different voting procedures approach these democratic principles. How many votes counted toward a winner? If we are to satisfy the first principle, this number should be as high as possible. How evenly distributed are votes for the winners? This question helps us measure how well a method addresses the word "equal" in the first principle. 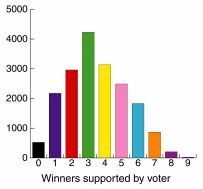 If some winners were elected with two or three times as many votes as others, then some voters have been more enfranchised than others. Most elections in the United States use this method: politicians divide the region into geographic districts containing roughly the same number of people. Voters in a district then elect someone from that district to the council. The candidate who receives the most votes is declared the winner. Ballots are organized by precinct. Neighboring precincts were lumped together into districts of roughly equal population and in a way that resulted in the most competitive elections. Candidates were assigned to the district associated with the closest polling place to their home address. Ballots were counted toward the highest-ranked candidate in their district. Note that because voters were not instructed to vote for candidates in their district, their voting behavior was different (and perhaps more honest) from what it would be in an ordinary single-member district plurality election. The chart shows a striking result: less than half of votes cast counted toward a winner! This means that, even if the city council made a unanimous decision, it would not satisfy the third principle by representing a mandate of a majority of voters. A comparable number of voters chose not to support any of the eligible candidates in their district (listed here as "votes for eliminated candidates"). Also, inequity on the council is very large. The least popular candidate earned a seat with less than one sixth of the number of votes for the most popular candidate. In a real single-member district plurality election, more votes would count toward winners, but only because voters' choices are restricted - the comparison to the other results presented here would not be very meaningful. In order to generate a clearer mandate for winners, many jurisdictions require a district winner to receive a majority of votes, not just the most votes. This is usually done (at great expense) by holding a second "runoff" election among the top two candidates from the first election. The Instant Runoff Voting method was used along with the districts defined above. If a candidate did not receive a majority of votes cast, votes for the last-place candidate were recast toward the next-highest-ranking eligible candidate. This procedure was repeated until a candidate had a majority. Given the time and expense invested in the runoff election, the improvement shown in the chart is not very impressive. A few more votes were cast toward winners, and a few more were cast to eliminated candidates. The entire council still does not have a mandate from a majority of voters. The least popular winner had slightly more than (as opposed to less than) one sixth of the votes of the most popular winner. In an at-large election, everyone is allowed to cast as many votes as there are seats to fill in the election. 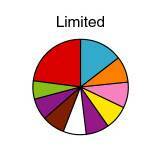 A number of candidates equal to the number of seats who receive the most votes is elected. This method is frequently used in local elections. The top nine votes on each ballot were tallied. Everyone's vote counted at least once, so no "eliminated" votes are recorded on the chart. The At-Large method shows some advantages over single-member districts in this election. 68 percent of votes were cast toward a winner, and the last-place winner had about two thirds the number of votes as the first-place winner. The catch is that there is a large inequity among voters. The bar chart shows that some people helped elect seven, eight, or even nine candidates while many helped elect one or zero. With some cooperation, it would have been possible for less than half of voters to elect the entire council. By this method, every voter is allowed to cast one vote. This and similar methods have been used to elect the Illinois legislature in the past, as well as many school boards and other such local jurisdictions in the South. This method makes it impossible for a voting block with a slight majority to take all the seats, an outcome that is possible with At-Large Plurality. The first-choice rankings on the ballots were tabulated. Despite its simplicity and bleak name, this method performs quite well. 77 percent of votes were cast toward a winner. The first-place winner received more than twice as many votes as the last-place winner. Votes are tabulated in rounds, and votes are counted toward a ballot's highest-ranked candidate who has not been declared a winner or loser in a previous round. A candidate who has more than 100/(n+1) percent of the vote, where n is the number of seats, is elected. In subsequent rounds, votes for that candidate count in proportion to the candidate's number of votes above the minimum. If there is no winner in a round, the last-place candidate is eliminated. A candidate can also win if there are no more contested seats. The 100/(n+1) number is used because it is the lowest possible value that prevents election of too many candidates. The software package called ChoicePlus Pro by Voting Solutions was used to compute the tally. The procedure is similar to the one actually used in Cambridge. The additional complexity of this method pays off well: 93 percent of votes counted toward a winner. This is so high that a majority of votes on the council (5) can be fairly described as a mandate from a majority of voters. Preferential voting methods are the only ones presented here that can routinely and genuinely satisfy the majority principle. Power on the council is distributed very fairly: six candidates were elected with exactly the same number of votes. The remaining three received an extra 5-15 percent from an eliminated candidate. This method is as close as they get to truly proportional representation. How do these systems affect who is elected? The results were actually quite similar, differing from each other by no more than one candidate. The results presented here are only an individual case study and involves some hypothetical elections, so it can be dangerous to generalize. It is quite clear, though, that choice voting produces a direct mandate to elected officials that comes much closer to satisfying democratic principles than the widely-used single-member district methods.